I first met Sunita when I enrolled in her numerology class. Since then, I have designated myself as a student for life! As long as she offers classes, I will continue to sign up. She is more than a teacher; I really consider her a spiritual mentor. She is passionate about sharing her wisdom, and she definitely has a gift for teaching the art of creative living. A few years ago I hired her to do a feng shui consultation for my home, and she continues to offer guidance when I have questions in regards to feng shui. I also took her Indian Cooking class, and love bragging to friends that for a white girl raised on meat and potatoes, I can make one mean and spicy masala! Sunita’s insightful advice has helped me discover new ways to bring a universal joy into my home and life. Sunita is magical yet firmly grounded in daily life. Her astute intuition supports people as they journey through life transitions. Sunita is deeply rooted in human ecology and seeks to help people find harmony in their relationships with others, their communities and their created environment. Suntia has graced my life for more than 20 years and I know if you meet her, you will be changed by her caring and knowledgeable presence. 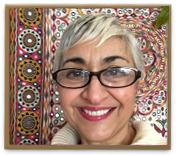 I took Sunita’s Feng Shui class at Francis Tuttle and was so impressed with her teaching and so drawn to her personality that I signed up for her Numerology class. I was equally impressed with her insight into such an interesting topic. After telling everyone that would listen that they needed to sign up for her classes, it became apparent that it would just be easier to get everyone together and have her do in-home consultations. We have had the opportunity to have several consultations of this kind and many family members and friends have been able to learn so much during each one! I recommend her website to many people and have taken out of town family to see her at the Spirit Fairs. Even the ones that get the “surprising” results from meeting with her have had nothing but great things to say about the experience. Sunita has become a very valued friend and we look forward to many future consultations! My interest in Feng Shui was piqued whenever I watched Sunita on the local Portland TV show, AMNW. This went on for several years and I would write down her recommendations because I admired her interpretations. Then on one show in 2016, Helen Raptis, the TV show hostess, asked Sunita if it [Feng Shui] worked. Sunita hung her head and laughed. While still chuckling and smiling, Sunita raised her head and replied, “Yes, or I wouldn’t be here!” That scenario revealed Sunita’s wonderful sense of humor. She was admired, but now she had endeared herself to me. I then called for an appointment and to my surprise my message was answered the same day. I was impressed with her business skills of prompt client service. Sunita’s consultation was priceless (as many can attest) for her knowledge, talent, gentle suggestions and charming personality. Even her name has sunshine built right into it. I feel Sunita is a treasure and I thank my lucky stars that I am in her world. “The Magic of 27” was how I came to know Sunita Sitara. My friend and neighbor kept insisting that I watch “The Magic of 27”, a segment on AM Northwest. All I had to do was get rid of 27 things! At the time I was feeling very stagnant and feeling that every move was an enormous weight. My dynamic and hardworking husband was feeling stagnated as well. He hadn’t had much recognition for his hard work and dedication. So we were both feeling in the dumps. I watched the video recording of the segment and felt elated. I love the fact that Sunita has a simple but profound approach to Feng Shui and her explanation of how our surroundings are a metaphor of what is happening inside ourselves and in our lives. I called her. Everything she said to me made perfect sense and I asked her for an appointment. We discovered weaknesses in so many areas we didn’t even realize! We are so happy and grateful for Sunita’s guidance and recommendations. The first week after placing the cures recommended by Sunita in the career and reputation areas of our home my husband received invitations to be a guest speaker at three different important events in one same day! Within a month, my husband received his long awaited recognition and promotion at work! We still have work to do and we are confident that we will see the same amazing results in the other areas of our lives as we continue to implement Sunita’s wonderful recommendations! They truly work and I would recommend her wholeheartedly and already have! Thank you Sunita! After doing a phone consultation with Sunita I realized how intuitive she was at a distance. I knew I needed to work with her in person. I hired Sunita to help with both increasing my business flow and eliminate some stagnant energy I was feeling at home. Working with Sunita on both of these together was a win/win. In hind sight I see how important it is to work on both the home and business. I have had my most prosperous year my business as well as in my life. She is an excellent resource for things that come up that haven’t already been dealt with. For example when conversing with her about what I’d like to do next – she came up with a Feng Shui cure/treatment that helped speed the process along. My daughter had moved away following her graduation and marriage. I had moved into the bedroom that was previously hers but was not sleeping well. My mother had died and there were things to go through in boxes stacked in my bedroom. I wasn’t making any progress on them. I had an office in another bedroom but I didn’t like going in there to work. I was expecting house guests in a month and was feeling very overwhelmed. In a workshop group that I participated in, another woman mentioned being helped by Sunita. So I contacted her and will always be glad that I did. My bedroom became a box and book free zone with pairs of things and colors to invite in romance and sleep. My living/dining area became more conducive for entertaining and several wonderful holiday and family events followed. The new arrangement in my office made it a space that I enjoyed. Sunita offered strategies and encouragement for clearing away or organizing the items in the boxes. In the time since my first session, I have experienced great and subtle changes. Shortly afterwards, I met someone who has since become my husband. I am keeping things in better order, traveling, and seem to have finances to support all my interests. Thank you, Sunita! Sunita, thank you so much for bringing peace back into my home. The advice you gave me about clutter, bathrooms, and a few well placed crystals has made my home feel so easy, peaceful and comfortable again. My children are learning and embracing that everything really does have its very own place. We have been able to donate several car loads of items we no longer needed to people who can use them. I was able to release items to others in need that I held on to from my past unnecessarily. My home has more energy, more positive energy, which gives me the energy to work on my fitness and weight loss goals now that my home is not dragging me down. The changes you suggested to our office have given everyone a fresh desire to succeed. We move easier within our office and customers have commented on how clean and welcoming our agency is now. We utilized a few crystals, the color red, plants, bells and a water feature by the front door as well as strategically placed colors and have seen a dramatic increase in our productivity. I enjoyed your class at Francis Tuttle and look forward to all that this path with bring to my world. Thank you again for all you have helped us accomplish. Thanks so much for all your advice and the great Feng Shui class you held in OKC last month – I’ve made most (still need to work on the rest!) of the changes you recommended and it’s almost unbelievable how many positive changes have happened since! Sunita – Thanks for a very fun class of Feng Shui at Francis Tuttle. I have used your suggestions and have hung the crystals. In the wealth/financial area (my kitchen) – love it! I have purple in the stained glass in the kitchen area. I put an angel in the front yard (helpful people/travel area), swept off my front porch, got rid of dead flowers. I have asked an old friend to give me an estimate on drapes and she wants to do a garage sale with me (hadn’t seen her for over a year). She has had many garage sales and is giving me some pointers. Looks like the helpful people suggestions and financial area both are working!! It hasn’t been that long since our class. I think of you often and give thanks often for your coming into my house and life. I have to tell you that from the time you came to our home our financial success has blossomed. Also, I can see my plan of working from home coming true, which is dream of most of most moms’. This year has been very successful and happy as of yet. Also, my relationship with my husband is getting so much better; we are spending a lot of quality time together and are most of the time on the same page. Our search for new home is not over yet and probably will be in touch with you soon if we decide on one. I just can’t imagine how little changes you had me do are affecting our family and social life. It makes me very confident and happy to know there is someone who I can trust and discuss my problems lifelong with as a guide and friend. I contacted Sunita after many negative experiences in my home and life. She provided an overall consultation of my home. I was surprised how many little things I had never noticed brought in negative energy. I was able to make a few changes very quickly. With each change I noticed positive experiences coming in to my life and a sense of peace in my home. The changes in my bedroom have allowed me to feel less stress and sleep more soundly. I am continuing to make changes and looking forward to all the future events coming in to my life. I have recommended Sunita to my friends and they have also begun to see the benefits of Feng Shui. My husband and I are very grateful that Sunita came into our lives. We had our home on the market for 4 years and had numerous contracts that all fell through. I had read some about Feng Shui but did not really know much about it. We did not really believe in it either. I went ahead and hired Sunita to come to our home and found her to be so warm and lovely. We followed her recommendations – thinking ‘what have we got to lose?’ In a time frame of less than 6 months, our home was sold!!! We love Sunita and would highly recommend her to anyone!! I have known Sunita for about 6 months and I found her thru Facebook. After getting my house and office Feng Shui consultation done, my life has changed for the better. I can never thank her enough. My current successful family life and business LIFE is all because of her. She has always made herself available whenever I needed her advice and or didn’t understand anything. I just wish to have her come to California one day to teach us all regarding Feng Shui and also Vision Board. Whoever is reading this, don’t hesitate and contact her now. You will never regret that email and or phone call. And to Sunita, Thank you from the bottom of my heart for been a part of my life and guiding me thru it. There are no words to describe how grateful I am to have you and knowing that I can email and or call and you and you always are there to help me out with those questions and guide me in the right direction. Sunita, I just had to share this with you! After taking your class earlier this year, I wanted to do a cure to help my daughter find her “true love”. Well, I placed a white vase with pink roses in the romance corner of her bedroom (it happened to be in her closet, but, oh well). Shortly after that she was introduced to a man by one of her co-workers, and, today, I am helping her plan her wedding on December 4!!! It is all very exciting, I really like my future new son-in-law, and my daughter is happier than she has ever been!!! I highly recommend Sunita Sitara as a Feng Shui consultant. Not only is she a lovely warm person but her advice has been great for me and my family. I’ve tried to do most of the things Sunita suggested and I’ve gotten results. Even if nothing had changed, I appreciate that my house and studio are glistening and clutter free. Also, when Sunita tells you to email or call with any questions, she means it. I have gotten prompt, in-depth replies to all of my questions. Feng Shui works – it’s as simple as that. I took the Feng Shui class at Francis Tuttle and thought it was great and found Sunita’s enthusiasm to be infectious. She did a consult at my business which has increased the energy and our overall success. She loves what she does, is incredibly talented and passionate about Feng Shui. She is extremely fair with her charges and is always available to answer further questions. I am so glad I got into that class and highly recommend her. Sunita consulted with me to Feng Shui our home. The energy was stagnant, really bottled up. We started off focusing on attracting greater financial prosperity. Sunita suggested a page full of remedies and I set out instantly to make changes. Almost immediately my husband was offered a higher paying job… in another town. We added some Fung Shui changes to attract a buyer for the house. The house sold in record time, 10 days. There were other homes in our neighborhood that had been on the market for months. THANKS Sunita! I have read many books about Feng Shui, but did not have confidence in what to do. Some of the charts were very complicated. Sunita made it simple by her interpretations. Feng Shui for me meant harmony, positive things, not a departure from my strong religious beliefs. Sunita came to my home and in a short time, located places for crystals, and places where the energy was not flowing. She also said I had “NO MONEY CORNER!” and remedied that by placing a crystal in the appropriate place. Within a week of implementing the suggestions, I received almost $30,000 from my insurance company for roof repair. I love my Feng Shui home, it if full of energy and new life. My writing and art work benefit from the new organized rooms. My space is bigger and I feel free and much calmer. I started taking better care of my health and do yoga 4 days a week. The crystal in my health area really works. Sunita figured out that my kitchen is my wealth corner. The crystal she hung there along with clearing the clutter has brought in a free airline tickets to California and a new roof for my house $11,700. Yeah! And I also sold two paintings. My paintings will be displayed in a new gallery in Guthrie opening in August. But most of all my energy is up. I am clearer to manifest and ask for what I want. The greatest gift is; that my health is better. My husband and I lived in a very unique home. (We had a lot of missing areas.) We were having several issues of conflict in different areas of our life and relationships. A friend told me about Feng Shui. I was skeptical but intrigued. I contacted Sunita for a consultation. She was able to offer many suggestions, some took a great deal of effort others were easy to fix. We found that our lives improved in so many impactful ways. We still get consultations periodically when we feel things are out of sorts and find practicing Feng Shui does shift energy in our life in a very positive way. I am so glad that Sunita came to my home and helped me organize it with Feng Shui. Many aspects in my life did change for the better. For example, somehow the mirror on my stove improved my finances to where I didn’t feel like I was using every penny of my check just to survive. My bedroom was the wrong color and was hindering me from getting adequate sleep; with the color change I now have restful sleep every night! These are just a few of the improvements made with feng shui. Sunita Sitara was the first person to help me get my finances together. Not because she is an accountant. But because she informed me that my money zone is a bathroom and my finances were going down the toilet. To solve the problem Sunita gave me a crystal to hang in the bathroom. I noticed a difference right away. I can’t explain it. I’m making the exact same amount. But now I have enough to pay all the bills with a little extra for savings. Thanks Sunita! Peace. That is what I felt the first time I met Sunita. I didn’t know what I was looking for. I just wanted to understand some things about my life. Sunita explained what my name means in numerology. The patterns make sense to me and explain the rhythms of my life. Suntia read the cards and was amazingly accurate with the changes and experiences I was experiencing at that time. I also received insight into the possible experiences coming in the future. I am able to make plans with a sense of detachment and a certain excitement. Sunita also remains supportive between readings. I feel so grateful. Last year I went through a divorce. I knew it had been coming for a long time. After the reading I felt as though the time was right. I was concerned about the effect it would have on my daughter. When I knew, because of the reading, it was a good time to make the change, the effect was minimal. My daughter is happy and my ex-wife and I communicate in a positive way. Now I am in the process of resting. I know this is where I am supposed to be. I recommend the services Sunita provides to anyone. I have known Sunita for over three years. How we met was pure kismet. Saying that she is amazing at what she does would be an understatement. I have used all of her services with great results. Sunita is very knowledgeable in the art of Feng Shui. I had an in home consultation. It was very thorough and detailed. Her simple but effective cures helped clear up so many blockages and allowed my money to begin to flow in. My favorite services are her tarot card readings and her intuitive readings. She is always eerily correct. She maintains a 100% accuracy rate. Unlike most readers that are vague and give generic answers, Sunita provides very detailed information. She is a very loving and caring person. She is a forever friend and I will always come to her for the help that I need. I was thinking about going to go get my cards read for fun/ the New Year (2014)… but didn’t know where to go. Then a few days later I saw Sunita on AM NW. She looked Positive and I got a good feeling about her. So I went to her website (which was easy to navigate) & made an apt. She got back to me right away & also came to me. Her price was fair and the reading was Fun, revealing & true. She made me feel comfortable, and she was super nice! I really enjoyed the mini reading from Sunita…it made a lot of sense. Wow – where do I begin? I had the pleasure of meeting Sunita a few years ago when I took her Numerology class at Francis Tuttle and I haven’t stopped! I immediately felt like I’ve known her forever. I love the private classes being offered and have learned so much about myself as a result. They have personally helped me go from a worrier and somewhat pessimistic to someone that chooses to be happy each and every day. If you haven’t had the opportunity to get to know Sunita…you are missing out! Your journaling class opened my eyes to a whole new way of journaling. Previously, I understood the value of journaling. However, I would get mental blocks which caused me to not want to write at all. Now I feel very comfortable and have the confidence to just start. In just a short time, I have found the benefit to be very therapeutic and cathartic. Each day I journal, it gets easier and easier. Upon hearing, Sunita, offered private classes on a variety of subjects I knew I had to attend. I found it an incredible way to meet new people and be exposed to interesting topics which would broaden my education and mind. I love learning and these classes offered a way to experience and understand topics I didn’t know much about, but wanted the chance to learn. Since I first signed up I’ve attended several classes and have had fun, learned about not just the subject-matter but about myself in the process. It has been a growing experience and I’m appreciative of Sunita for offering such unique learning opportunities. I highly recommend joining the classes. Proverb: The best time to plant a tree? Twenty years ago. The next best time? Now. If you’ve been thinking about investing in yourself and learning different ways to think about life I recommend you take some of Sunita’s classes. I learned painless ways to decrease my ecological footprint and been shown astonishing insights on how I personally can attract or discourage financial stability. During Sunita’s classes I never fail to learn something about how my view of the world and how I relate to the people and conditions I live with can help me live a fuller life. Sunita teaches with a gentle hand, encouraging students to participate and make their own destiny. Each monthly class with Sunita has a “stand alone” subject, but the classes do compliment each other. It is always startling when the time is up, it goes so fast! Come join us. It’s fun to watch your tree take root and grow. The classes I took were fun and informative. The thing that stands out the most for me was all of the “Positive Energy” I left with. It helped me learn about my past and what I want for my future. You have definitely made an impact on my life and I am so happy that our paths have crossed. Sunita, thank you for being you! Sunita’s cooking classes are magical. She brought one to my home for a group of women and provided delcious food and delightful instruction. It was a great way to treat my friends to a unique and special evening. Sunita and Reina came to my home and prepared a feast! My guests were so impressed by the vegetarian meal prepared by these two women. Most of my friends are meat eaters, I wanted them to experience how fulfilling a vegetarian meal can be. They were all amazed at how flavorful every dish was. I will definitely ask Sunita and her daughter to guest chef another party! I’ve now taken 2 classes with Sunita, one of which I brought my mother and father from NY with me to experience. We all enjoyed the class so much. I purchased the spices from Sunita after I took her Indian cooking class and love, love, love, them. After my father went back to NY he mentioned the spices to me and how the ones he found tasted different. Since I am a nice daughter I sent him some of my ‘garam masala’. He said it is like night and day the difference between the blend I sent him and the one that he purchased at the store. Long story short, Sunita’s spices are the real thing and well worth the few dollars that’s for sure. Thanks for everything! Each year our family choses the food of a different country to make for Christmas dinner. Last Christmas we voted to make a dinner of Indian food and were fortunate enough to find Sunita’s class in time to prepare. We all enrolled together and had a wonderful, educational and fun-filled evening. The week after the class she met us at an Indian food market and taught us how to buy quality items for our meal. To make it a little easier, she helped us by packaging small amounts of certain spices that she knew we would need. The dinner was a huge success and the “garam masala” she made was magnificent. We have begun the voting for this year’s Christmas dinner and a repeat of last year keeps being suggested! Thank you Sunita for making our Christmas meal a success and teaching us skills that have opened another culinary option for us. I took the Indian Cooking class at Frances Tuttle with 2 friends. We had a great time, loved learning the technique & about all the various spices & ingredients. Sunita and her daughter are a lot of fun to listen to and watch prepare the dishes. My friends planned a dinner a few weeks after the class and we each made a few recipes from the class – it was a success! Sunita prepared a spice pack of the various spices & blends and I so enjoy having them in my pantry! I plan to buy a Masala Dabba (spice tin set) to keep them fresh longer! Thanks Sunita, I enjoyed meeting you and learning how to cook with yogurt and your unique ‘garam masala’. Indian food is so healthy & delicious. I attended the Indian cooking class Sunita teaches at Francis Tuttle. Sunita and her lovely daughter Reina were delightful. I love the spices and her special secret masala. I will be returning for the Tofu class she teaches, I am determined to eat healthier. I am deeply grateful. Dear Sunita, One morning last week my husband mentioned that he slept through the night. This was a big deal as he never enjoys full uninterrupted sleep. Prior to that I had two large lawn bags full of extra bedding I had been storing under our bed for our son. As instructed by you in class I removed everything out from under the bed to prevent blocking the flow of Chi. Well it worked, Chi flows and my husband is snoozing again. Thank you Sunita! From a grateful student, Tyra T.
Sunita is an incredible teacher and wise Feng Shui practitioner who’s humor and whit make the learning process entirely too much fun! She can expertly identify energy blocks and uncover hidden sources of stagnation while interjecting compassion in to every piece of advice. Even though her Feng Shui class was at night after a long day of work, the time flew by and I left each class feeling far more energized and refreshed. Through her hilarious anecdotes and generous teachings I walked away with advice and information I will treasure for the rest of my life. She forever changed my perspective for the better and I highly recommend her class to anyone who is curious about Feng Shui or life in general. I have enjoyed taking private Yoga classes from Sunita. She is right – her routine is simple yet powerful. I am more flexible now. I feel calmer, anytime I feel stressed, I do one of the breathing exercises she taught and I can feel my stress level going down. Yoga is now part of my daily life. Those crystals are amazing! I hung the crystals where Sunita suggested. In no time at all things in my life began shifting. It’s true! My energy level went up, I cleared away clutter and new opportunities came bounding into my life! When I heard Sunita on the radio with Drew and Kaci too, I enrolled for her numerology class immediately. Listening to her I realized I really wanted to learn more about this subject. She didn’t disappoint me as a teacher. In fact I enrolled in her Feng Shui class and told my sister and niece about her classes too.